Wet scrubbers literally wash dust and particles out of the air. 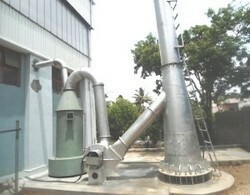 Dust scrubber is based on the venturi scrubber principle. Exhaust air is forced into a spray chamber, where fine water particles cause the dust to drop from the air stream. Established in the year 2005 in Tamil Nadu, we, Ashwa Groups, are a leading Manufacturer, Exporters and Supplier of a wide range of premium-quality Home Appliances like Non Stick Tawa, Pressure Cooker, Pressure Pan, Induction Kadai, Paniyarakkal Pan, Detergent powders and soap. These are well-known among the clients for their unique features such as rust-resistance, safety, durability, non-stick surface and low maintenance needs. These home appliances are also known for their low fuel consumption. These consume few quantities of fuel and are supplied to clients at leading market prices. The best quality of raw materials is sourced from leading vendors of the market keeping in mind the specifications furnished by the clients. We supply pressure cookers to clients in various specifications throughout the country. These are a commonly used cooking item in the Indian kitchens. Latest technology is used to manufacture of these cookers so that clients and end users have the best experience using our products. These are known for their unmatched quality and unbeatable prices.